We are manufacturer of Crucible Jewels Tong. Majorly used for holding Crucibles. Metal Wire, rolled, flat at joints with corrugated jaws. 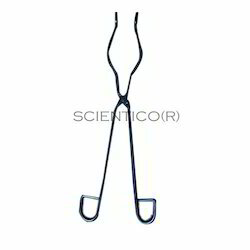 We are involved in manufacturing and exporting an extensive range of Crucible Tongs, which are ideal for varied operations in chemistry laboratories. Widely demanded in various Schools, Colleges and other Research Institutions, these tongs are made of quality metal and are resistant to corrosion and offer excellent finish. For safe handling of beakers containing hot solutions and for pouring out the contents. The jaws are asbestos covered to ensure firm grip. Overall length of tong 30cm approx. Made of steel chrome plated. 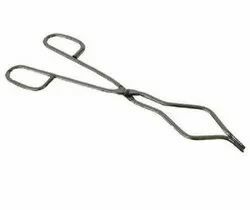 Crucible tong : It is made of mild steel, black paint/chrome plated or teflon coated. Being a prominent firm in this domain, we are engaged in offering a distinguished assortment of Crucible Tong. We are offering SS Crucible Tong to our client. Application : Pharma Industry, Chemical Industry, All types of laboratories, Institutes & Research Centres.